World renown photographer Monte Nagler, like any visionary artist, has established new inroads for his work to capture viewers. Whereas some utilize more provocative and controversial methods, Nagler has sought a much more serene path. Nagler's landscape and nature photography vary from the lush to breathtaking, always beautiful, always letting the scenery do the talking. The Monte Nagler Fine Art Photography Studio uses these inspiring images to create custom wallpaper for a calm and soothing atmosphere, specifically within the realm of health care. 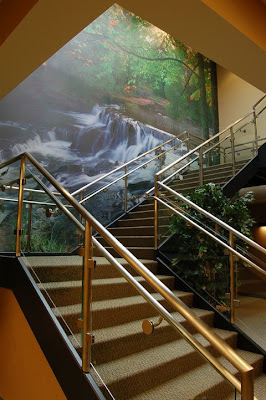 Monte's work, when translated into a wall mural, has numerous benefits for patients and staff alike. Clearly a peaceful green garden bursting with spring flowers is much more pleasing to the eye than the traditional sterile white hospital corridor. His work instantly puts patients at ease, which in turn makes their treatment even more successful. This truly is a major therapeutic tool for medical professionals, who also personally reap the rewards from Monte's wall murals. Just as the environment is made more enjoyable for the patients, the staff in turn is able to get a moment of peace and tranquility in during their otherwise overworked day. Monte's wall murals have been installed in health care facilities across the country, and his collection of photography has been assembled over a lifetime of travels around the world. See more of Monte's photography at www.montenagler.com , and check out more of his work at www.photosforhealing.com , where you can see examples of his installed wall murals.